Receive paperless statements that are easy to store and organize. Pay your bills online with no envelopes, checks, or stamps required. Control your finances with email alerts for bill arrivals, due dates and upcoming payments. Log into Online Banking to utilize our “Bill Pay” service. Most FIs provide online external funds transfer service, as well. The member will need the UKRFCU routing number (236084832) and the full checking/savings account number to make a transfer. For Bill Pay, the UKRFCU main branch address may be needed, as well. Please make sure the member is aware of this information when speaking to him/her. For more detailed information on this service, please refer the member to his/her external FI. If a member uses external Bill Pay service to transfer funds to the UKRFCU account, in most cases, a paper check will be generated by the system and sent to the UKRFCU address. It may take up to 7 business days for the check to be delivered to UKRFCU. 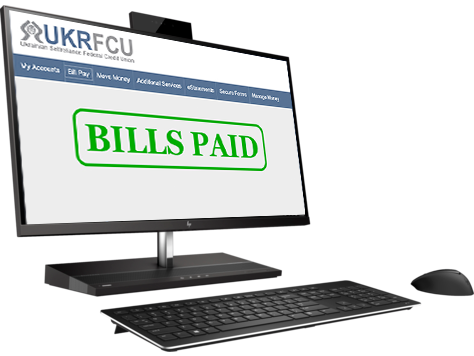 Bill Pay checks must be payable either to the member or UKRFCU.